At Arlington Pediatric Dentistry, we pride ourselves on providing expert dental & orthodontic treatment to children throughout the Arlington, VA area. Our doctors and highly trained team of pediatric dental specialists work hard to help each patient develop a beautiful, healthy smile in the long term, and we have the skills and experience to make every trip to our office a pleasant experience for all involved. Crafting a beautiful smile is a lifelong process, and that process starts with the primary teeth. Eating: Primary teeth are critical in helping your child learn to eat correctly. The primary teeth are how your child learns proper biting, chewing, and swallowing habits. Speaking: In addition to eating, primary teeth help your child learn to speak. Without a healthy smile of baby teeth, it's more difficult for your child to learn correct speaking habits and pronunciations. Guides: The primary teeth serve as guides for the permanent teeth as they erupt into place. 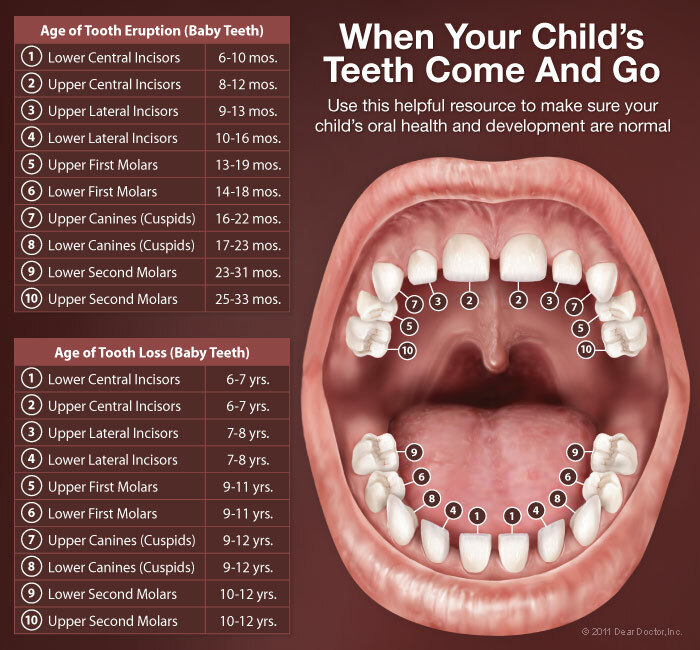 Without a complete set of primary teeth, it's more likely for permanent teeth to erupt out of alignment, necessitating orthodontic care later in life. Oral Hygiene: In addition to all these functions, your child builds oral hygiene habits using the primary teeth. Setting habits for a thorough, diligent practice of oral hygiene early in life is the best way to safeguard your child's smile through their entire lifetime! 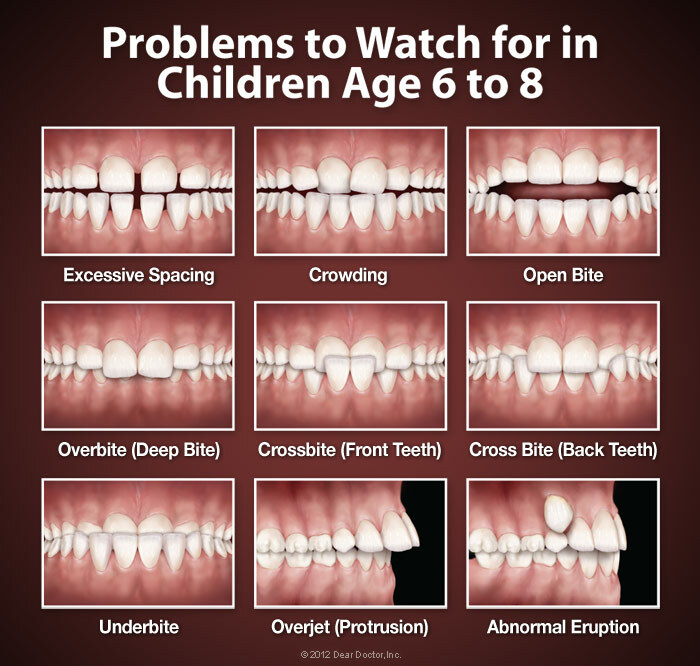 You can expect teeth to start appearing sometime between ages six to nine months, although it may take up to a year. 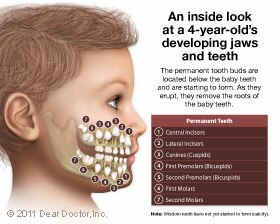 You'll see the two lower front teeth first, followed by the two uppers, the molars, and the canines. This process, known as the teething period, can be painful for children, so it's normal for children to get a little cranky during teething. 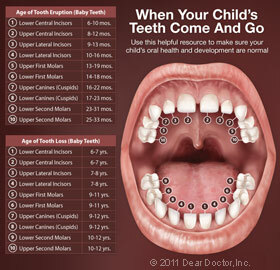 If you need help dealing with your child's teething, give us a call and we'll provide suggestions. After each feeding, you should gently wipe your infant's gums and new teeth with a water soaked gauze pad or damp washcloth. Once they have more teeth in their mouth around age 2, you can start a daily brushing routine. Start with a small, soft-bristle toothbrush and a tiny smear of toothpaste. You can expect your child to need help brushing their teeth until around age 6. In accordance with the American Academy of Pediatric Dentistry, we ask parents to bring their child in to see us by their first birthday. This may sound a little early, but the first visit is important for helping us get to know you and your child, getting your child accustomed to the dentist's office, and monitoring your child's dental development. More than anything, this is a light, simple appointment centered on helping your child feel comfortable at our office. Topical Fluoride: Fluoride is a mineral that's crucial to the strength and integrity of teeth, and if we determine that your child isn't getting an adequate supply of fluoride, we may recommend a topical fluoride treatment. This is a simple treatment that involves applying a fluoride gel to your child's teeth and letting it sit for a minute or so. Dental Sealants: The grooves on the chewing surfaces of the rear molars are nearly impossible to keep clean, and they present a near-perfect environment for bacteria and plaque to grow. This makes them a hotspot for cavities. Dental sealants are a preventative treatment that seals the molars with a plastic coating, preventing cavities in the rear molars and providing years of protection for your child's teeth and smile. Root Canals: Root canals are a common treatment for adults to save damaged and decayed teeth, and sometimes, children need root canals too. Contrary to popular belief, a root canal is a nearly painless procedure that's simple to complete, restoring your child's tooth to its regular appearance and function. Bonding: Being a kid can be rough sometimes, and accidents are bound to happen. We can fix minor chips and fractures to the teeth with tooth-colored bonding materials. These are thin, lifelike resins, usually made from a plastic or glass composite material, that match the color, shape, and texture of teeth, returning a chipped or slightly damaged tooth to normal in no time. Some kids are lucky enough to get a perfect smile without ever needing braces – but more likely than not, your child will need some form of orthodontic treatment in their lifetime. We'll give your child their first orthodontic examination around age 7 – this may sound early, but it's actually the ideal time to spot current problems or problems that may develop in the future. Even if we don't start treatment right away, evaluating early lets us monitor your child's growth and choose the perfect time to start treatment. We love to watch our athletic patients out on the field, court, or in the pool – but unfortunately, sports can put teeth at a greater risk to damage. Thankfully, a custom-made mouthguard is a simple, inexpensive solution that can protect your child's teeth during sports. In fact, a study by the American Dental Association found that athletes are 60 times more likely to suffer harm to their teeth when they aren't wearing a mouthguard! We can fit your child for a custom mouthguard right here in our office, so if you've got a budding young athlete, just let us know and we'll set them up for a mouthguard at your next appointment. Pediatric dentistry is critical to the development of your child's smile in the long term, and if you have any more questions about how to help your child develop a beautiful, healthy smile, we're always here to help. Feel free to call us at 703-671-KIDS (5437) or reach out to us at our contact page with any questions, or if you'd like to come by for an appointment at our Arlington office, you can request one using our easy online form. We can't wait to hear from you, and we look forward to helping your child develop a healthy, beautiful smile!